Stillwater Artsapalooza Schedule– June 22, 2013 6-10 p.m.
Stillwater Artsapalooza Schedule of Events- June 22, 2013 6-10 p.m. Admission to all performances is free; no food purchase is required. Don’t forget to “go green” and use the Bike Valet at Rose’s Bike Shop! For more than six years, VELMA, an Orono band, has been entertaining local audiences. 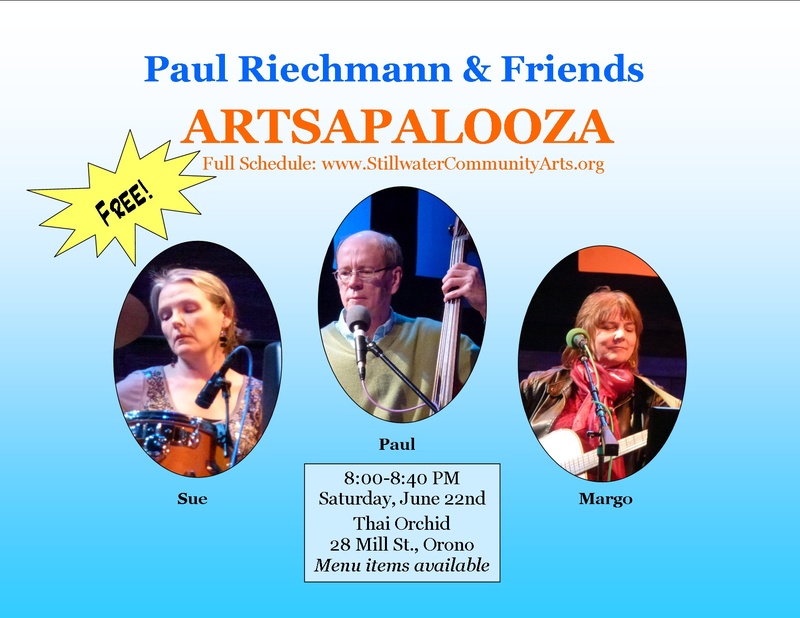 VELMA couldn’t round up all of her members for Artsapalooza this year, so Paul Riechmann, Margo Lukens, and Sue Hamlett accepted the invitation to perform some of their favorite songs in a quieter, more intimate style. Paul will be leading the trio on his double bass; Margo and Sue will be adding acoustic guitar, percussion, and VELMA’s signature vocal harmonies. This stripped-down, jazzy set should be a fun change of pace. A Dixieland Band and Nestor Gonzalez and Colin Graebert sing! Stillwater Artsapalooza is an amazing chance to see a wide variety of artists– where else could you hear a folk duo at The Store, then a Dixieland Band at the Fire Station, a Show Choir at the Catholic Church and finish off your evening with a fantastic concert of musical theatre at the Church of Universal Fellowship? Saturday, June 22 is sure to be an amazing evening and we are excited to welcome for the second and third year in a row respectively, the Six Basin Street All Women Dixieland Band and Nestor Gonzalez, Colin Graebert and Friends! Finally, Nestor Gonzalez and Colin Graebert are well-known musical forces in our community. Both have beautiful tenor tones and Colin’s ability to tinker on the keyboard while singing away is mesmerizing! Any concert with Nestor and Colin at the fore-front is bound to be an entertaining one. Nestor will be singing, with a few of his friends: Blaise Collett, Hannah Barry, Jenn Chaloult to name a few. 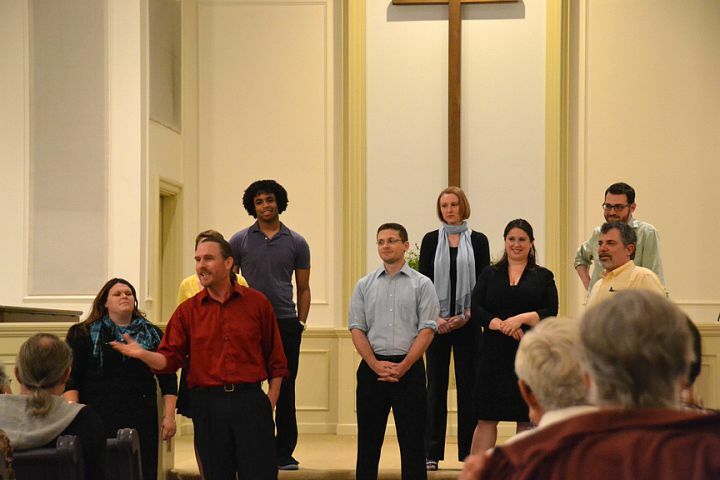 They’ll be performing a variety of contemporary musical theatre songs. If you’re interested in hearing Colin before (or after) Artsapalooza, check out his website here and catch one of the numerous bands with which he’s associated. Nestor, Colin and Friends will be performing at the Church of Universal Fellowship from 9p.m.-9:40 p.m., don’t miss them! 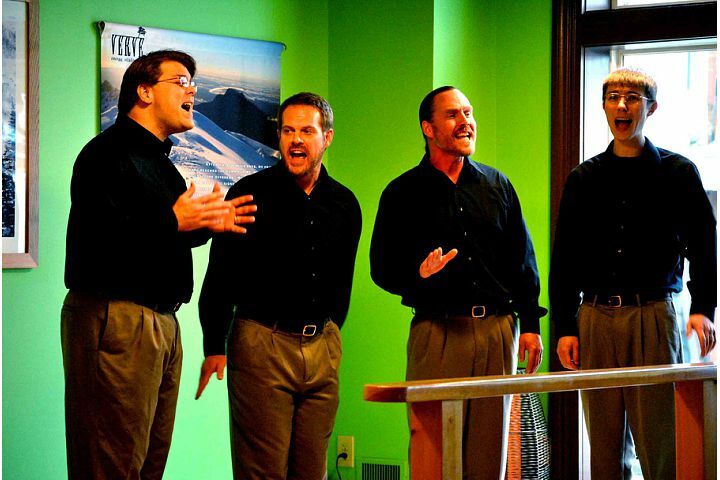 Who doesn’t love A Capella music? Tight harmonies, fun lyrics, and an all around good time, which may be why our featured a capella group is aptly named Good-Time Sound. Good-Time Sound has been singing together for over three years. 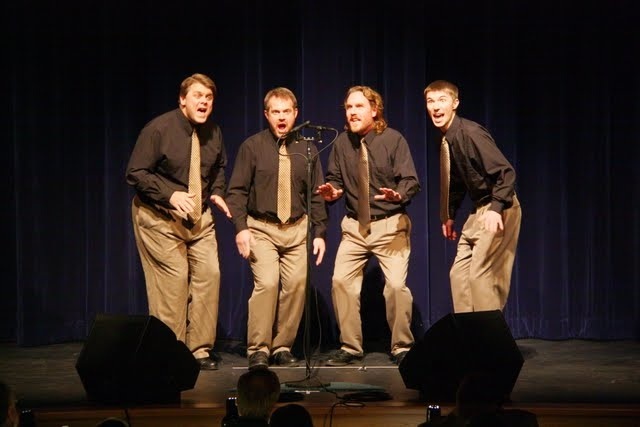 They first harmonized as the cast of the clever musical Forever Plaid at the Waterville Opera House and they enjoyed the sounds and company so much that they just kept on “busting chords” together as an a capella quartet! Last year one of their original members, Todd Lake, moved on to bigger and better things down south, but they’ve found a replacement and are back at making music that’s better than ever! Good-Time Sound love to sing and perform a variety of musical genres from doo-wop to barbershop, contemporary to classical. Some of their favorites are Blue Moon, Brown-Eyed Girl, Happy Together, King of the Road, Mood Indigo, Sitting on the Dock of the Bay, and the list goes on. 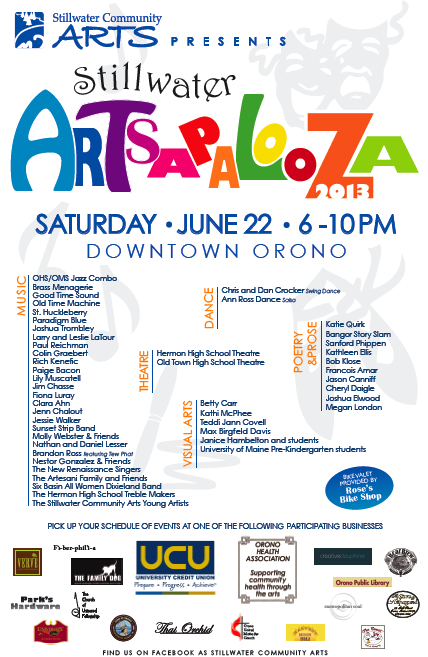 So come hear this fantastic group at Stillwater Artsapalooza on June 22 all over downtown Orono. Catch them at The Store/Ampersand from 6:00-6:30 p.m., The Black Bear Brewery from 7:00-7:40 and finally at Verve from 8:00-8:40 p.m.
“Within my paintings, I hope to give voice to those that could not speak for themselves. My medium is mostly watercolor inks, and india ink. all of my images come to me in dreamtime, and the poetry I share with them are their stories.. may your journey be a walk of peace, hope and light.” Julie’s work will be at Stillwater Artsapalooza on display at Parks Hardware (or the old Maine Maven) from 5:30 p.m.-8:30p.m. We are incredibly pleased to have the St. Huckleberry band playing at Stillwater Artsapalooza again, this time at The Family Dog from 9:00-9:40 p.m.
St. Huckleberry is an eclectic mix of Celtic-tinged Hard Folk originals and hopping Acadian Fiddle. A reviewer once said, “St. 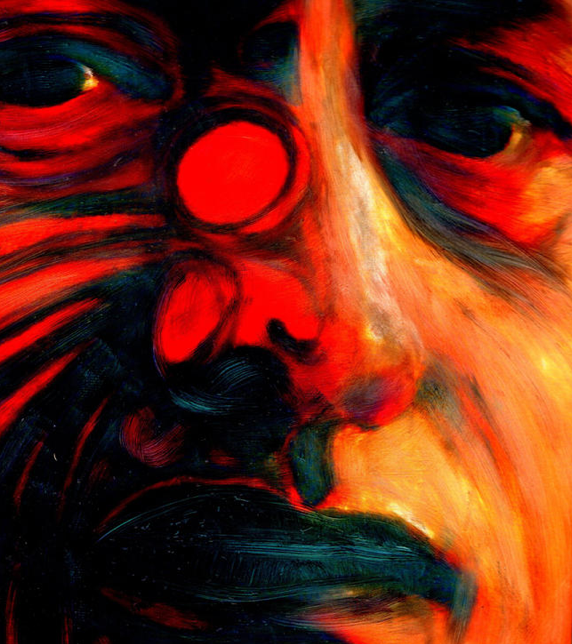 Huck is a rather savory blend of roots rock with a touch of blues and a twist of Celtic. The songwriting is tight, and the musicianship crisp. What really makes the sound distinctive, however, is the contrast between the vocals and the viola (some of the tastiest viola to be heard around these parts for a long time).” Don’t miss the chance to hear this awesome group in action! 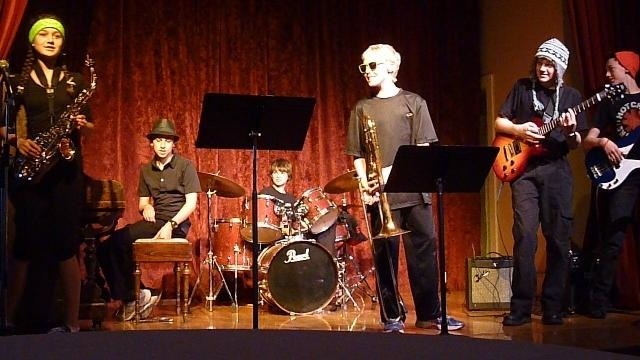 What started as a sugar-fueled conversation between students at a school dance two years ago has become a jazz combo that combines Orono Middle and High School students. Under the guidance of Steve Hodgdon, this group has developed into the most exciting young jazz group in Orono. They are set to play at the University Inn, poolside, from 6:00-6:40 p.m. and again from 7:00-7:40 p.m. Finally, members of the Hermon High School Theatre Arts 2 class will be performing pieces from their spring showcase at St. Mary’s Catholic Church on Main Street from 6:00 p.m.-6:40 p.m. The pieces run the range of humor to poignant, so don’t miss the chance to see these remarkable students make you laugh and shed a tear or two. Back by popular demand we have Paradigm Blues, the awesome blues rock fusion band performing at Stillwater Artsapalooza at The Family Dog at 7p.m. and The Roost at 9 p.m.
Paradigm Blues plays a mix of new and classic blues. 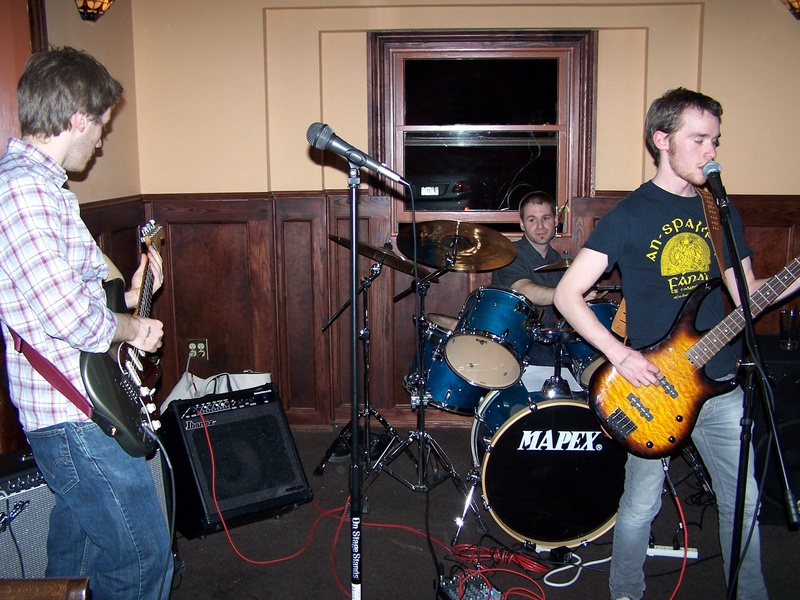 They cover songs by Jimi Hendrix, The Black Keys, John Mayer Trio, and more. The members are all current University of Maine studens. Chris Young is a Psychology major, he plays Bass and sings Lead Vocals. Kevin Hanselman is a Computer Engineering major, he plays Guitar and sings Backup Vocals and Scott Alexander rounds out the band on drums and is an Electrical Engineering major. Another group of performers back again are the Hermon High School Treble Makers. Hot off their recent Show Choir State Championship win they will be performing their award winning set list Gold: Moments of Light. Gold is a combination of stories from the students’ lives combined with inspirational music. The set list includes MoTown hits, 80s rock, rap, musical theatre, and a few pop tunes. The Treble Makers will be performing at Old St. Mary’s Church at 8p.m., don’t miss this remarkable group! Stillwater Artsapalooza is a festival of performing and visual arts that involves over 50 local artists and is on Saturday, June 22, 2013 from 6:00p.m. to 10:00 p.m. in downtown Orono. Artists will be performing and displaying their work at 16 downtown Orono venues including the Church of Universal Fellowship, The Store, Verve, The Family Dog, Parks Hardware, Thai Orchid, Harvest Moon, The Roost, Bear Brew Pub, Orono Public Library, University Inn, DeGrasse Jewelry, Orono United Methodist Church, the Keith Anderson Community Center, Orono Fire Station, and Old St. Mary’s Church. Admission is free.